Do you know the name "Tom Clancy"? Are you familiar with his work? He writes novels. His first book was called "The Hunt For Red October". Have you read that? Have you ever seen the movie? Sean Connery is in it, and so is Alec Baldwin. Does any of this ring a bell? In my opinion it was a great book, much better than the movie. It's about a Soviet sub commander, played by Connery, who either decides to defect or launches a sneak solo attack against America. The Americans can't tell what he's up to at first. All they know is that he is headed for the East Coast of the USA, in a nuclear-missile submarine, and against orders. A really good read, and like all of Clancy's work, notable for the accuracy of its descriptions of both American and Russian military equipment, procedures, and nomenclature. It is so accurate, in fact, that shortly after "Red October" was published, Clancy was summoned to the White House. Ronald Reagan lived there at the time, and he had read the book. Everyone in the White House had read the book, it seemed, and they had called Clancy in to find out how he had learned all the details which he had put into his novel. According to the story that came from that meeting, they were amazed to find out that everything he had written was based on material that was available in the public domain! Yes, it was all out there, tools, tactics and jargon: it was all public knowledge if you knew where and how to look. Clancy, who had spent many years playing and developing table-top war-simulation games, knew where to look, and he told them so. After that, his books kept getting better and better, and the White House kept reading them. Clancy is the perfect author as far as those guys are concerned; all his stories paint the US military as Good Guys in a fight against Evil, and they always win, eventually. I wouldn't be surprised if the White House offered Clancy the same deal the Pentagon offers Hollywood: Say nice things about us and we will give you virtually unlimited assistance! But I am not sure about this part. I'm only speculating on that one, even though it makes a lot of sense. And I want to be careful about speculation because I want to keep this article as factual as possible. Clancy's masterpiece, in my opinion, was a tale of global warfare called "Red Storm Rising", in which he demonstrates a knowledge of the Soviet Union which rivals or exceeds anything I have ever read elsewhere. And I have been reading American and Soviet history for a long time. But that's another story -- maybe later. In 1996, Clancy published a novel called "Executive Orders", which by the way is dedicated to Ronald Reagan, whom Clancy calls "the man who won the war". The main plot line of "Executive Orders" concerns a terrorist attack, using biological weapons, in which the USA triumphs over evil again, after many close calls, of course. But then ... in the climactic scene of that novel, a demented JAL pilot kills his co-pilot and takes control of his passenger plane, which is full of fuel, of course, and he crashes it into the Capitol building, killing all the members of both Houses of Congress, who are assembled there for a joint session, waiting to hear a speech from the President. Fortunately for the President, he and his wife escape death by a scant few feet; they are just about to emerge from an underground tunnel as the plane strikes. The President sees the flash and goes back into the tunnel, his life is spared by a matter of seconds! Wow! What a finish! What a book! The CIA has long had a policy of reading every book that ever gets published. Fact or fiction, English or foreign languages, they read everything. They say they are looking for new ideas, new techniques, new ways to commit a crime. They say they don't want to be surprised by a case where life imitates art. That's what they say. They are possibly using the ideas for other purposes, of course, so I don't know how much to believe. But I do believe that they are reading everything they can get their hands on. And even if they are not reading absolutely everything that gets published nowadays, with the so-called information explosion happening everywhere, they are certainly reading Clancy. As well they should. He's a master of suspense, a gifted storyteller, and his knowledge is first-rate. Hell, I read Clancy. I read "Executive Orders" in 1999, when it finally came along in deleted paperback for only $7, rather than the $35 or so that it cost for the hardcover edition. 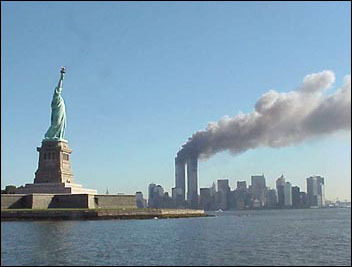 Now: What did I see on September 11, 2001? Here's my story. I usually sleep late. We usually don't turn on the TV until late in the day. And so we knew nothing until about 10:00 AM (Eastern Time). The phone rang, my wife answered it, and after only a few seconds she yelled "Come quick! Something's happening! Turn on the TV!" So I turned it on and started flipping through the channels. But it didn't matter where I went because every station was showing the same thing. They were running the same short clips over and over again: a passenger jet hits the WTC, sending up a big fireball. Then a tower collapses. Over and over. 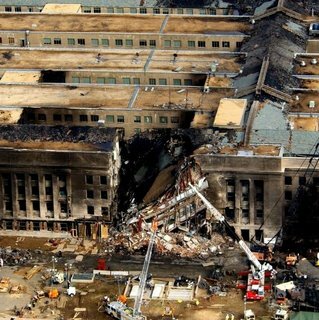 At some point we heard about the attack on the Pentagon. At some point we saw video of the second tower collapsing. I had started rolling a videotape within seconds of turning on the television, and I watched that tape a bit, later. Unfortunately, I didn't keep the tape. I thought it was too morbid, too scary, too awful to keep. I wish I still had that tape today. All I have is my memory... But I have a pretty good memory. What did I think when I saw those clips? The first thought that came into my mind was "Message from bin Laden: 'Ignore us at your peril'" ... and the next thought that came to me was "But how? How could this happen? They know about him. Hell, if I know about him then surely they do! And how could hijacked airplanes fly freely in the most heavily defended airspace on the planet?" All this came to me within 10 seconds after I turned on the television. Then my wife's voice came to me -- virtually disembodied, and seemingly from a great distance. She was saying: "What's happening? Is this World War Three?" I said: "I dunno." But I was thinking: "Oh yeah". I spent parts of the day watching TV, looking at all the major networks as well as the local coverage out of NYC. The rest of the day I spent pacing and thinking and trying very hard not to lose my marbles completely. Eventually all the action seemed to have stopped, and no more planes were in the air, so no further hijackings were possible. And it seemed that everyone had suddenly become so completely stupid that nobody could imagine that terrorists could possibly attack in any other way, which of course they could. But they didn't, so we all started to relax, and after a while the networks shifted into something that approximated 'analysis'. And I began to notice something strange: all the major networks were bringing in scads of talking heads and many of them were former or current national security dweebs. I know that current and former national security dweebs don't normally give scads of interviews, so I was curious to see so many of them, seemingly everywhere, and all at the same time. 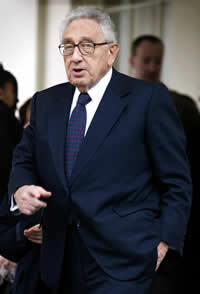 And I paid close attention to what they were saying, particularly Henry Kissinger, who said, as did all the others, "Well of course it's a tremendous tragedy, but we have to remember that this was an attack not just on America but on the entire world, and the whole world needs to work together to eliminate international terrorism." Maybe this is not the exact wording of Kissinger's message, but it is very close. It is very close to what they all said. They may have used slightly different words, but they were all saying exactly the same thing. And as I paced around and tried to hold onto my marbles, I started to realize some of the implications of what I had just seen. On 9/11 we saw all kinds of different reactions from all kinds of different people, and all of them were just bowled over by the event: the magnitude, the ferocity, the skill and knowledge that must have gone into the planning. And I began to wonder: How could it be that during this completely unexpected, completely unprecedented, completely new kind of event, an event so startling that many people on the ground in Manhattan said they felt as though they were watching a movie rather than reality, all these national security dweebs were not only taking it all in stride, but also, and even more tellingly, all saying essentially the same thing about it? How could this happen? I kept pacing, holding tight to my marbles, and asking myself some very tough questions. Later in the afternoon, Secretary of Defense Donald Rumsfeld gave a short briefing in which he said (I'm paraphrasing again) "We had no idea that something like this could be possible. We could never have imagined terrorists using passenger planes as weapons, crashing them into buildings; this is just so outrageous that nobody could have imagined anything like this, let alone prepared for it or defended against it." To me it sounded as if Rumsfeld had just said "We don't read Tom Clancy". National Security Adviser Condoleeza Rice appeared on TV that day too, and she said essentially the same thing. 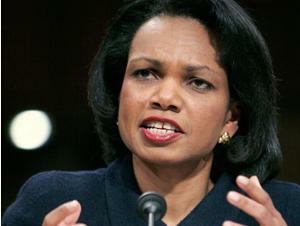 The official White House transcript of Rice's 9/11 press conference gives her words as: "I don't think anybody could have predicted that these people would take an airplane and slam it into the World Trade Center, take another one and slam it into the Pentagon; that they would try to use an airplane as a missile, a hijacked airplane as a missile." Maybe she really could not have predicted what "these people" [whoever they were] would do. But then again, maybe her sentence was deliberately structured in such a way as to make it impossible to disprove. But to me it sounded as if Condoleeza Rice had just said "We don't read Tom Clancy". Clancy is an expert on the Soviet military. Rice is a Soviet specialist too. And she doesn't read him? She had no idea that anyone "would try to use an airplane as a missile"? Yeah, right. So ... I have been suspicious of the 'official story' ever since 9/11. Or perhaps I should rephrase that. 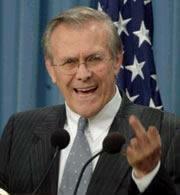 Suppose Rumsfeld had come on TV and said "You have just witnessed a military coup d'etat. We are in control now. No further dissent will be tolerated. That is all." If he had said that instead of what he did say, I would not have been surprised. Let's put it that way. I kept watching the video of the WTC towers falling. And it looked like they had blown up, at least to me, even though the talking heads kept saying they had "collapsed.". I kept thinking about what Rumsfeld and Rice had said that day, and how the towers had fallen, and none of it made any sense ... except if they were hiding something. But then denial kicked in. I didn't want to believe what my eyes had seen, what my ears had heard, what my brain told me it all meant. And so I didn't accept the obvious truth of the matter right away. But I kept my eyes and ears open. Over the next few days and weeks I began to see more holes in the story, more impossible coincidences, more utterly unbelievable aspects to the tale. Eventually I was able to convince my sentimental heart that what my brain had figured out on the afternoon of 9/11 was indeed true. It was an inside job. They knew it was going to happen, and it coincided with their secret agenda completely, and they took full advantage of it. Or maybe rather than sitting back and allowing it to happen, they actively made it happen. It doesn't really matter how you phrase it; these are two ways of saying the same thing. In an event of this nature, allowing it to happen is the same as making it happen. I did a lot of pacing and wondering during the week of the tragedy. And I paid close attention to everything. Some of the things that happened after 9/11, happened so soon after 9/11, that it's impossible to imagine they happened in response to the event. But I am getting ahead of myself here. 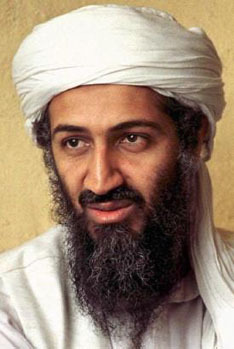 At some point, early in the afternoon, I believe, the talking heads on all the TV stations started to talk about Osama bin Laden, although they were spelling his first name "Usama" back then, and eventually it was reported that bin Laden was holed up in Afghanistan, and by suppertime we had most of the details that we would ever get: names and grainy photos of the hijackers, news of a rented car found abandoned at Logan with a flight manual in the back seat -- written in Arabic! And news that among the zillions of tons of toxic grey dust that covered Manhattan, someone had managed to recover an alleged hijacker's passport -- and it was intact, although it was singed around the edges, of course. By the end of the day the outline of the story was out -- and by the end of the next day the 'whole story' was out: 19 hijackers had taken control of four planes and done all this damage. And the leader of this whole evil bunch was a guy by the name of Osama bin Laden, who just happened to be hanging out in Afghanistan. It seemed strange that they didn't have any idea what was happening or who was doing it at 9:00 in the morning but by 9:00 at night the whole complicated plot had been solved. Very strange indeed. It seemed strange that the national security wonks came on TV at the same time and said the same thing. It seemed strange that Rice and Rumsfeld both said "this could not have been expected". All these things made no sense... except if it was a 'black op'. In black ops -- clandestine operations -- the 'official story' is called a 'legend'. In a classic black op, the legend is carefully constructed and documented long before the crime is committed, and then the details are slowly leaked to the stunned public. The same thing happened when JFK was killed. At 2:00 in the afternoon, JFK was dead but we didn't know anything else. By midnight the whole story was out: the crime had been committed by a communist sympathizer acting alone, who had already been arrested and charged. Everyone was safe, the nation was told. And the 'case' was 'closed'. But in the week or so after 9/11, I spent a lot of time thinking about the term 'legend' and reflecting on how, if this were a black op, the legend had been disseminated. It all seemed too pat. It all seemed too conclusive. It all smelled so fishy. And I thought: Maybe the reason why it smells so fishy is because it's fish! In other words, you're watching a legend develop. Late on the night of 9/11, there were huge vigils in Manhattan. People had brought pictures of their lost loved ones, whom they called 'missing'. There were flowers and candles all over the place, people sitting quietly holding hands or just staring into the tiny flames of the candles. It was a heartbreaking scene, repeated over and over all over lower Manhattan. At many points it was too painful to watch. But at one point when I was watching, the TV camera found and zoomed in on something that looked very out of place. There amid the flowers and the candles, among all the weeping silent people, there was a hand-painted sign, which, if I remember correctly, said "President Bush: Bomb Afghanistan Tonight". Ever since that night, I have wondered who painted that sign, who planted it in the midst of those grieving people, and who pointed it out to the TV cameraman. I didn't sleep that night. I didn't sleep much for the next week or two. Maybe it was a month; I can't really remember. But it doesn't make any difference. I kept listening to the radio and watching TV, looking for clues to what had happened on that horrible Tuesday morning. Items drifted in, large and small. I videotaped some more TV coverage, and I got a copy of the "fireman video", the French crew's accidental shot of the first plane crashing into the first tower. I got piles and piles of footage of the towers falling, and I noticed that it was all the same footage. Every network seemed to have the same cut-and-pasted sequence showing 'highlights' of the day's events. Crash, burn, crumble. So the scene of the second plane crashing into the second tower was everywhere too, and the more I looked at the footage of the two planes, the more suspicious I got. The two collisions, the two planes themselves, looked very different. Much more so than could be explained by the difference in cameras and the difference in camera angles, and so on. It looked like there were two very different kinds of planes! Two very different kinds of impacts, too. And I remembered hearing early eyewitness reports saying that the impact with the first tower involved a 'small, military-type aircraft'. This report got buried in the avalanche of legend-building, but I always wondered whether it might have been true. Eventually, I began to hear other news of the day. Some of it came from European radio broadcasts. One such item concerned an 'emergency preparedness drill' that had been scheduled for the morning of 9/11. The drill involved a disabled airplane crashing into a CIA building in Virginia. And the story came out through the CIA's own website. I heard about it on the radio. And that was the last straw. I could no longer trust my sentimental heart. My brain had been right all along. We'd been duped. 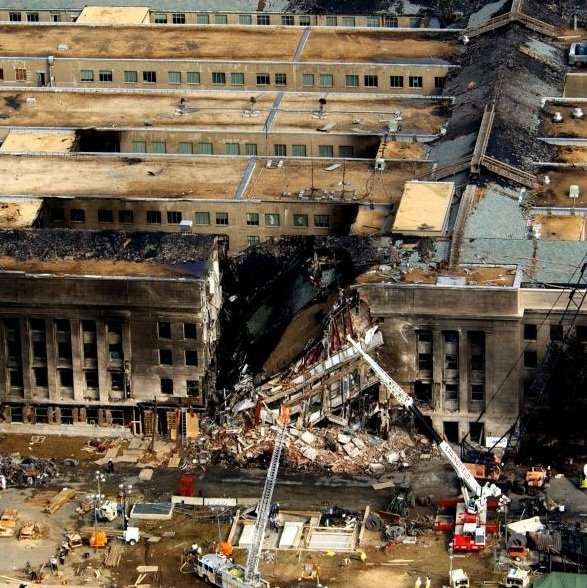 The people we trust to protect us couldn't have predicted an event such as a plane flying into an office building, and in fact they were so completely unable to predict such an event that they were preparing to run a drill -- that very day -- based on that very scenario. Oh yeah. Yeah, right! Either that, or our government had been infiltrated, at the highest level, by murderous traitors. I knew that one of these two was impossible. But as far as I knew, everyone else had bought into 'the legend'. I've known for a long time that there are a lot of kooks publishing kooky stuff on the internet. I had seen for myself many examples of web pages containing blatant falsehoods. And I have never trusted anything I have found on the net, at least not without extensive checking. But please note: I have not mentioned anything here that came from the internet. Everything -- every single thing -- that made me suspicious of the 9/11 legend came from the mainstream North American and European media. None of these details were presented as refuting the legend, of course. But for those who were paying attention, the refutation was there, right along with the legend. I've read a lot of analysis since that day. Some of it seems like disinformation to me; some of it seems like it might be accurate. I don't think we will ever know which parts are real and which parts are not. I don't think we will ever know the complete story of what happened on 9/11. But then again I don't think it matters very much. We have seen enough now to know that the legend was false. And that's enough for me. A conspiracy is a plan, usually an evil or unlawful plan. It involves two or more people. The denial of the fact of a conspiracy, i.e. the cover story, is like a bubble. Once any part of it is proved to be false, it bursts and the cover story is exposed. Like a balloon, it is not necessary to burst a cover story with ten or fifteen pins. It collapses with only one bit of circumstantial evidence that is undeniable. In retrospect I can see so many parallels between the JFK assassination and the 9/11 attacks that I find myself wondering whether these two national tragedies are all part of the same event: a gradual coup d'etat that has turned America from a more-or-less peaceful liberal democracy into a raging war-mongering tyranny. I don't have any answers, but I sure do have a lot of questions. And I'm reminded of a beautiful song, a minor hit from the mid-seventies. The band was called "Ace". The lead singer was Paul Carrack. I think he wrote this, although I am not sure. I'll try to find out. And how long has this been going on? These are the times that try men's souls. The summer soldier and the sunshine patriot will, in this crisis, shrink from the service of their country; but he that stands it now, deserves the love and thanks of man and woman. Tyranny, like hell, is not easily conquered; yet we have this consolation with us, that the harder the conflict, the more glorious the triumph. My "main blog," Winter Patriot, has been mostly dormant for quite a while, but some other sites are still active, including: our community blog: Winter Patriot dot com; my current project: Sherlock Holmes and the Alderney Street Mystery; the data-banks for that project: The Spy Who Knew Too Much, Operation Pathway, Tweets from the Inquest into the Death of Gareth Williams; and Winter Parking. There are other mostly-dormant sites: Visas For Terrorists on how the US moves Islamic bad-guys around the world for training and deployment; Peroxide Plotters on the trials of the "Liquid Bombers"; old news in small chunks at The Whispering Campaign; and some music therapy: Cold Tunes. Send me email or post a comment at Winter Patriot dot com. They don't deserve to be impeached. But it would be a good start. There comes a time in every man's life when he has to stand up for what he believes in; otherwise how can he call himself a man? If you had any idea what F democracy means and what your F country has done, you’d be down on your F knees begging your Christian god to forgive you every F day for the rest of your sad F life. And I gave my heart to know wisdom, and to know madness and folly: I perceived that this also is vexation of spirit. For in much wisdom is much grief: and he that increaseth knowledge increaseth sorrow. He who learns must suffer, and even in our sleep pain that cannot forget falls drop by drop upon the heart, and in our own despair, against our will, comes wisdom to us by the awful grace of God. Put WP headlines on your Google homepage or click here for other subscription options. What Caused The Killer Tsunami? Who Gassed The Kurds In Halabja? “The Nearest in Love:” On how the Sri Lankan Death Cult Betrayed the Islamic Values of the Qur’an - "You will find that the nearest to them in love are those who say 'We are Christians.'" All a Rich Man's Trick - --*source*--"
Research and writing by Winter Patriot. Powered by Blogger.